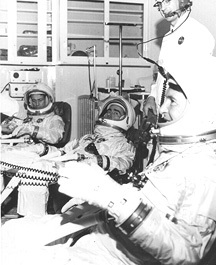 Back-up crew of (L-R) Donn Eisele, Walter Cunningham, and Wally Schirra in their modified G-3C space suits. WASHINGTON D.C. March 21, 1966 -- Twelve astronauts were named to flight crews today -- including the first manned Apollo mission -- and two others assigned earlier were shifted to a different mission. Prime crewman for the Apollo Earth-orbital mission, tentatively scheduled in the first quarter of 1967, are Lt. Col. Virgil I. 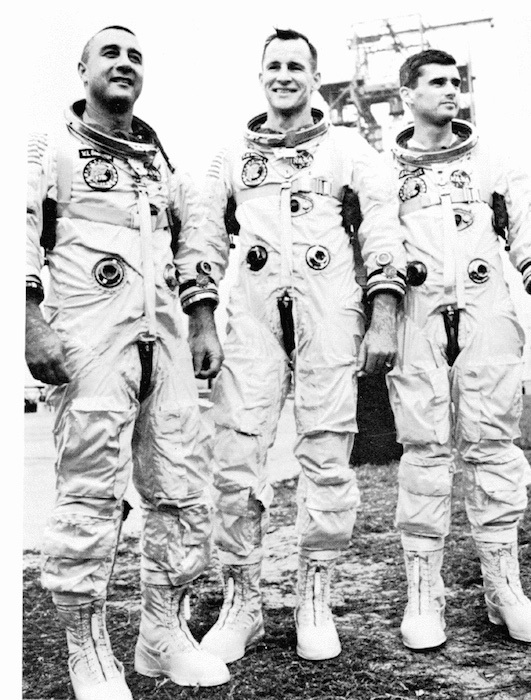 "Gus" Grissom, USAF; Lt. Col. Edward H. White II, USAF; and Navy Lt. Roger B. Chaffee. Their backups are Lt. Col. James A. McDivitt, USAF; Maj. David R. Scott, USAF; and Russell L. Schweickart, a civilian employee of NASA. Assigned as prime crewman for the Gemini II mission scheduled in the last quarter of this year, are Navy Cmdr. Charles " Pete" Conrad, Jr., command pilot; and Navy Lt. Cmdr. Richard F. Gordon, Jr., pilot. Backups are Neil A. Armstrong, command pilot; and USAF Capt. William A. Anders, pilot. Backup crewman for the Gemini 10 flight, Navy Capt. James A. Lovell, Jr., and USAF Maj. Edwin E. "Buzz" Aldrin, Jr., were reassigned as backup crew for Gemini 9. The original Gemini 9 backups, USAF Lt. Col. Thomas P. Stafford and Navy Lt. Cmdr. Eugene A. Cernan, became prime crewman for that mission after the deaths of civilian astronaut Elliot M. See, Jr., and USAF Maj. Charles A. Bassett II, last Feb. 28. Replacing Lovell and Aldrin as the backup crew for Gemini 10 are Navy Lt. Cmdr. 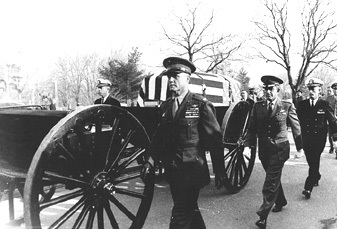 Alan L. Bean, and Marine Maj. Clifton C. Williams, Jr. The first manned Apollo mission could come as early as the fourth flight of Saturn IB. The first Saturn IB flew successfully on Feb. 26. Duration of the first manned Apollo mission, as presently conceived, will be determined on an orbit-by-orbit basis for the first six orbits, then on a day-by-day basis for up to 14 days maximum. Its orbit is to carry as high as 265 statute miles with a perigee of 100 statute miles. Prime goal of the flight will be to verify spacecraft, crew and ground support compatibility. As presently planned, Gemini 11 will be a rendezvous and docking flight of up to three days duration. Rendezvous is scheduled in the first revolution, with the flight crew using onboard systems to compute their own trajectories and maneuvers. Ground systems will be used as a backup. Plans call for the spacecraft to re-rendezvous with the Gemini 11 Agena vehicle, which procedurally will be a passive target the second time. The re-rendezvous also will be accomplished with the use of onboard systems. Extravehicular activity is planned, using a hand-held maneuvering unit similar to the one which was to have been used on Gemini 8. Duration of extravehicular activity and tasks to be performed will be based on experience in Gemini 9 and Gemini 10. Approximately eight experiments are tentatively scheduled for Gemini 11. All will be repeats of experiments flown previously but a list of specific experiments will not be available until a re-evaluation is completed. The Gemini 11 Agena will be parked in a high orbit for possible use during Gemini 12. The launch profile and orbital parameters will be essentially the same in Gemini 11 as those in Gemini 8. The Agena will be launched into a 185-statute-mile orbit and rendezvous will be accomplished at that altitude. Navy Cmdr. John W. Young, command pilot, and USAF Michael Collins, pilot, remain as the previously announced prime crew of Gemini 10. By 8:00 that morning, a thousand men, to support three spacesuited astronauts--Virgil Grissom, Edward White, and Roger Chaffee--were checking systems to make sure that everything was in order before pulling the plugs. 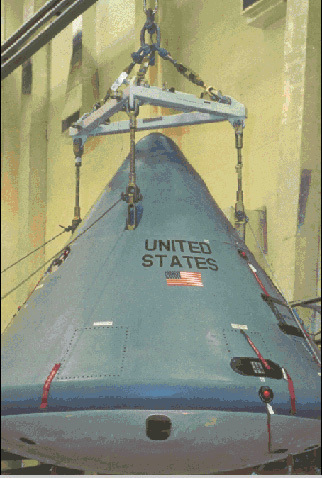 In the blockhouse, the clean room, the service structure, the swing arm of the umbilical tower, and the Manned Spacecraft Operations Building, this army of technicians was to go through all the steps necessary to prove that this Block I command module was ready to sustain three men in earth-orbital flight. Twenty-five technicians were working on level A-8 of the service structure next to the command module and five more. mostly North American employees, were busy inside the clean room at the end of the swing arm. Squads of men gathered at other places oil the service structure. If interruptions and delays stretched out the test, as often happened, round-the-clock shifts were ready to carry the exercise to a conclusion. Throughout the morning, however, most of the preparations went smoothly, with one group after another finishing checklists and reporting readiness. As all traces of sea-level atmosphere were removed from the suit circuit and spacecraft cabin, pure oxygen at a pressure of 11.5 newtons per square centimeter (16.7 pounds per square inch) was substituted. The crew checked lists, listened to the countdown, and complained about communications problems' that caused intermittent delays. The men could speak over four channels, either by radio or telephone line, but the tie-in with the test conductors and the monitors was complicated and troublesome. Somewhere there was an unattended live microphone that could not be tracked down and turned off. 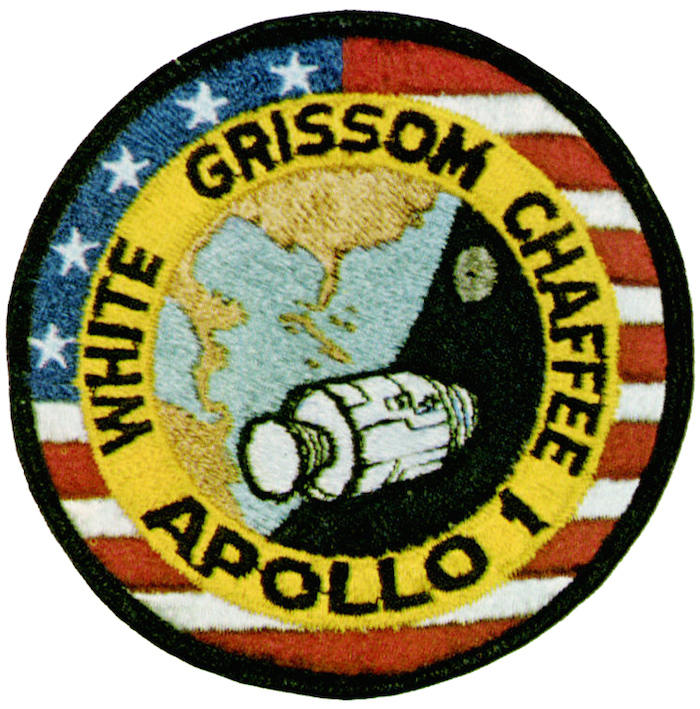 Other systems, Grissom's crew noted, seemed to be operating normally. At four in the afternoon, one shift of technicians departed and another came on duty. Stunned, pad leader Babbitt looked up from his desk and shouted to Gleaves: "Get them out of there!" As Babbitt spun to reach a squawk box to notify the blockhouse, a sheet of flame flashed from the spacecraft. Then he was hurled toward the door by a concussion. In an instant of terror, Babbitt, Gleaves, Reece, and Clemmons fled. In seconds they rushed back, and Reece and Clemmons searched the area for gas masks and for fire extinguishers to fight little patches of flame. All four men, choking and gasping in dense smoke, ran in and out of the enclosure, attempting to remove the spacecraft's hatches. In the clean room, despite the intense heat, Babbitt, Gleaves, Reese, Hawkins, and Clemmons, now joined by Rogers, continued to fight the flames. From time to time, one or another would have to leave to gasp for air. One by one, they removed the booster cover cap and the outer and inner hatches--prying out the last one five and a half minutes after the alarm sounded. By now, several more workers had joined the rescue attempt. At first no one could see the astronauts through the smoke, only feel them. There were no signs of life. By the time firemen arrived five minutes later, the air had cleared enough to disclose the bodies. 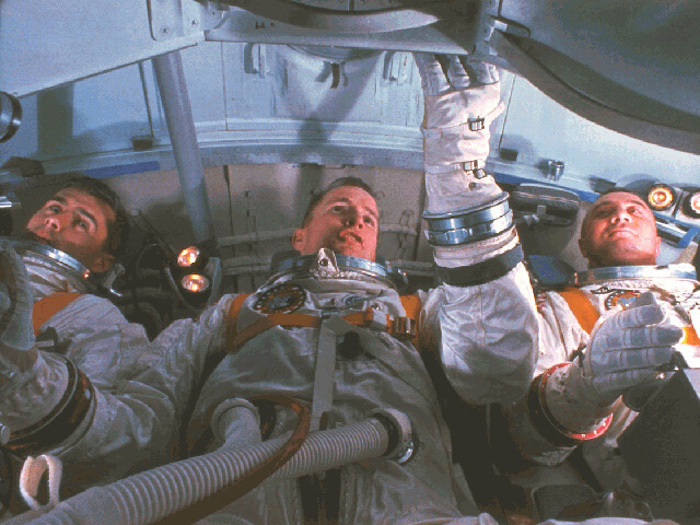 Chaffee was still strapped in his couch, but Grissom and White were so intertwined below the hatch sill that it was hard to tell which was which. Fourteen minutes after the first outcry of fire, physicians G. Fred Kelly and Alan C. Harter reached the smoldering clean room. The doctors had difficulty removing the bodies because the spacesuits had fused with molten nylon inside the spacecraft. Most persons who had been connected with the space program in any way remember that the tragedy caught them by surprise. In six years of operation, 19 Americans had flown in space (7 of them, including Grissom, twice) without serious injury. Procedures and precautions had been designed to foresee and prevent hazards; now it was demoralizing to realize the limits of human foresight. Several other astronauts had died, but none in duties directly associated with space flight. Airplane crashes had claimed the lives of Elliot See, Charles Bassett, and Theodore Freeman. These were traumatic experiences, but the loss of three men during a ground test for the first manned Apollo flight was a more grievous blow. The accident that took the lives of Grissom, White, and Chaffee was heartrending, and some still insist totally unnecessary; but NASA had always feared that, in manned space flight, danger to pilots could increase with each succeeding program. Space flight officials had warned against undue optimism for years, pointing out that any program that large inevitably took its toll of lives--from accident, overwork, or illness brought on by the pressures of such an undertaking. Man was fallible; and a host of editorial cartoons reiterated this axiom for several months after the fire. One, by Paul Conrad in the Los Angeles Times, showed the spectre of death clothed in a spacesuit holding a Mercury spacecraft it one hand, a Gemini in the other, and with the smoldering Apollo in the background. It was captioned "I thought you knew, I've been aboard on every flight." 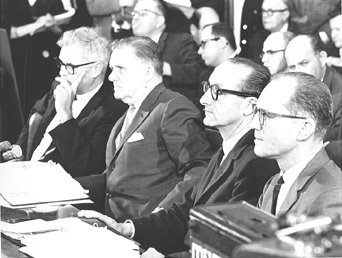 In Washington on the day of the accident, an Apollo Executives' Conference was in session, attended by NASA leaders James Webb, Robert Seamans, and George Mueller and by top Gemini and Apollo corporate officials, to mark the transition from two- to three-man space flight operations. That morning the conferees had been invited to the White House to witness the signing of a space treaty. President Johnson described this event as the "first firm step toward keeping outer space free forever from the implements of war." Later, as the tragic news from Pad 34 spread, the executives considered disbanding. Administrator Webb, however, decided to carry on; Mueller would stay in Washington and Seamans and Samuel Phillips would go to the Cape. The next day, Mueller reported the first few meager facts to the meeting and then gave a paper that Phillips had intended to present. Seamans returned to Washington that evening, consulted with Webb, and drafted a memorandum formalizing the AS-204 Review Board with Thompson as chairman. Members were astronaut Frank Borman and Max Faget of the Manned Spacecraft Center, E. Barton Geer of Langley Research Center, George W. Jeffs of North American, Franklin A. Long of Cornell University and the President's Science Advisory Committee, Colonel Charles F. Strang of the Air Force Inspector General's office, George C. White of NASA Headquarters, and John J. Williams of Kennedy Space Center. Spacecraft 014, nearly identical to 012, was shipped from California to Florida. 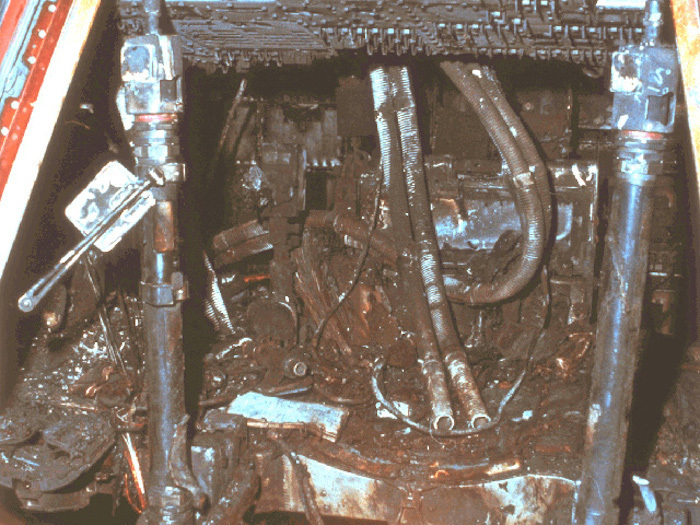 There the Thompson Board and its panels had the vehicle dismantled for comparison with the remains of 012, which was being taken apart and every piece studied and analyzed. Thompson took advantage of the background and experience of his board members, assigning some to monitor several of the panels. While technicians worked around the clock for the first few weeks, the board held daily recorded and transcribed sessions to consider the findings. Strang was an effective vice-chairman, drawing on his background as an inspector to organize proceedings and prepare comprehensive reports. Van Dolah, the mining explosives expert, had only one panel--origin and propagation of the fire--to monitor, emphasizing the importance of finding that answer. Thompson reserved a single panel, medical analysis, for himself. Faget had the heaviest load of panels: sequence of events, materials review, special tests, and integration analysis. 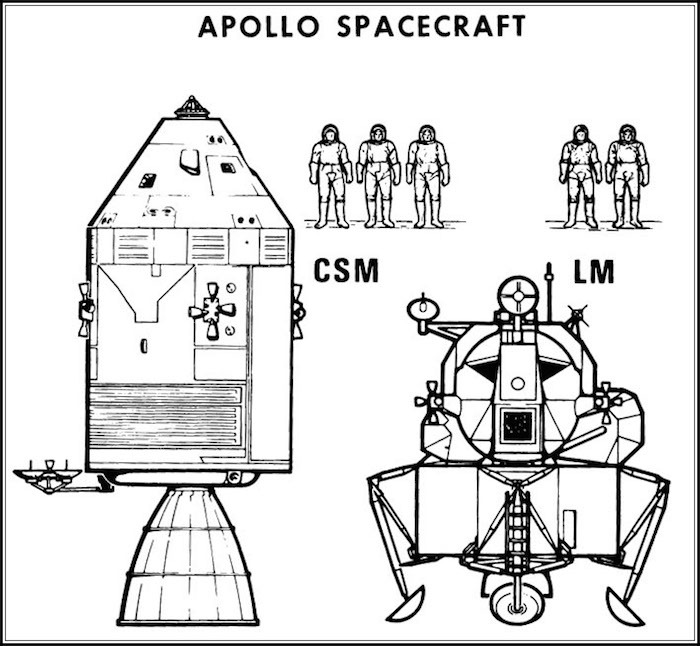 Borman drew the teams on disassembly, ground emergency provisions, and inflight fire emergency provisions. Williams monitored the spacecraft and ground support equipment configuration, test procedures review, and service module disposition. George White, quality and reliability chief from Headquarters, was responsible for investigations into test environments, design reviews, and historical data. An associate of Thompson's from Langley, Geer handled the groups on the analysis of spacecraft fractures, the board's administrative procedures, and the safety of the investigation operations themselves. Strang was left with the panels taking statements from witnesses, handling the security operations of the inquiry, and writing up the final report. When Seamans made a second preliminary report to Webb, on 14 February, it was clear that the fire was indeed a fire, and not an explosion leading to a fire. Physical evidence indicated that the conflagration had passed through more than one stage of intensity before the oxygen inside the cabin was used up. By mid-February, the work of tearing down the command module had reached a point where a two-shift six-day week could replace round-the-clock operations. conducted with a mockup of the new configuration. The Thompson Board report came to almost 3000 pages; divided into 14 booklets, it made up a stack about 20 centimeters high. The six appendixes were: (A) the minutes of the board's own proceedings; (B) eyewitness statements and releases; (C) the Operations Handbook for spacecraft 012; (D) final reports of all 21 panels; (E) a brief summary of management and organization; and (F) a schedule of visible evidence. As they delved deeper into the reasons behind the tragedy, NASA officials were confronted by some "skeletons in their closet." Senator Walter F. Mondale raised the question of negligence on the part of management and the prime contractor by introducing the "Phillips report" of 1965-1966. The implication was that NASA had been thinking of replacing North American. But the charges were vague; and, for the next several weeks, no one seemed to know exactly what the Phillips report was. In fact, Webb at first denied that there was such a report. (See Chapter 8.) Mondale also alluded to a document (The Baron Report) by a North American employee, Thomas R. Baron, that was critical of the contractor's operations at the Cape. Baron was a rank and file inspector at Kennedy from September 1965 until November 1966, when he asked for and received a leave of absence. He had made observations; had collected gossip, rumor, and critical comments from his fellow employees; and had written a set of condemnatory notes. He had detailed, but not documented, difficulties with persons, parts, equipment, and procedures. Baron had observed the faults of a large-scale organization and apparently had performed his job as a quality inspector with a vengeance. He noted poor workmanship, spacecraft 012 contamination, discrepancies with installations, problems in the environmental control system, and many infractions of cleanliness and safety rules. Baron passed on these and other criticisms to his superiors and friends; then he deliberately let his findings leak out to newsmen. North American considered his actions irresponsible and discharged him on 5 January 1967. The company then analyzed and refuted each of Baron's charges and allegations. In the rebuttal, North American denied anything but partial validity to Baron's wide-ranging accusations, although some company officials later testified before Congress that about half of the charges were well-grounded. When the tragedy occurred, Baron was apparently in the process of expanding his 55-page paper into a 500-page report. Although the Senate committee had begun its hearings while the board investigation was in progress, the House subcommittee waited until the final report was ready. By then, the Senate had touched on most of the major issues. As expected, the exact cause of the fire in spacecraft 012 was never determined, but the analysis of all possibilities led to specific corrective actions that eventually satisfied Congress. Throughout the hearings, Borman, still wearing two hats--as an astronaut and as a member of the Apollo 204 Review Board--was very effective. In the course of his testimony, Borman reiterated that the cause of the fire was oversight, rather than negligence or overconfidence. Fire in flight, he said, had been a matter of grave concern since the early days of aviation and the subject of numerous studies. But the notion that a fire hazard was increased on the ground by the use of flammable materials and an overpressure of pure oxygen had never been seriously considered. 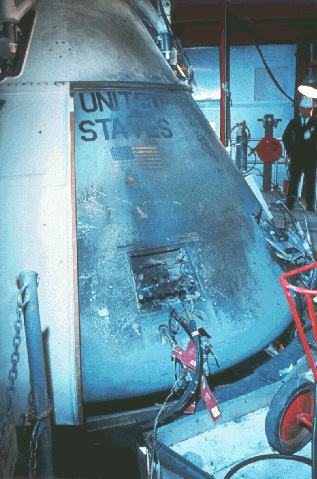 Essentially the story of the Apollo accident is known to the American people. We have admissions and statements about the things that NASA ... and ... North American Aviation [were] doing wrong. . . . . But I want to say this to you, Mr. Webb. Over the past few years....I probably have been one of the most critical members on this committee of NASA. It appeared to me. . . . that you have had it too easy for your own good from this committee. This is not a criticism being directed at you or the Space Agency, but a criticism being directed inwardly at the Congress and this committee. I feel right now that you got less criticism than you deserved fin the past, but now] you are getting more criticism than you deserve. I don't intend to add to it for that reason. Wydler did not really stop there, of course, but the investigation did begin to fade away. NASA and North American began implementing the technical recommendations. To some degree, the accident actually bought time for some pieces of Apollo--the lunar module, the Saturn V, the guidance and navigation system, the computers, and the mission simulators--to catch up with and become adapted to the total configuration." Meanwhile, on 23 April 1967 the Soviet Union announced the launching of Vladimir M. Komarov aboard a new spacecraft. Soyuz I appeared to be functioning normally at first. On its second day of flight, however, the craft began to tumble, and Komarov had to use more attitude fuel than he wanted to get the ship under control. He tried to land during his 17th circuit but could not get the proper orientation for retrofire. Komarov succeeded in reentering on the 18th revolution, but his parachute shroud lines entangled. The cosmonaut was killed on impact. So both Soystz I and Apollo 1 put their programs through traumatic reassessments. No one found any consolation in a "rebalanced" space race. In fact, Webb took the occasion to emphasize the need for international cooperation by asking: "Could the lives already lost have been saved if we had known each other's hopes, aspirations and plans? Or could they have been saved if full cooperation had been the order of the day?" Of immediate importance was the new unified hatch--unified meaning that the complicated two-hatch system was redesigned into a single hatch. The new component was heavier than the old, but it would open outward in five seconds, had a manual release for either internal or external operation, and would force the boost cover cap out of the way on opening. It could also be opened independently of internal overpressure and would be protected against accidental opening by a mechanism and seal similar to those used on Gemini. The management of all industrial safety offices within NASA was revamped, with responsibilities flowing directly to the top at each location. At the launch center, fire and safety precautions were upgraded and personnel emergency preparations were emphasized as never before. Also, at the launch complex itself, a sliding wire was added to the service structure to permit a rapid descent to the ground. Reliability and test procedures were more firmly controlled, making it difficult to inject any last minute or unnecessary changes. The contract situation with North Americas, had reached a peculiar stage even before the fire. The cost-plus.incentive.fee contract NASA had negotiated with North American in October 1965 had expired on 3 December 1966. In late January 1967, the legal status of relations was in some doubt. The objectives of the incentive contract had been to reverse the trend of continuing schedule slips, to get Block I vehicles delivered from the factory, to speed up Block II manufacturing, and to bring costs under control. Progress had been made on all fronts by the end of 1966; the flights of Block I spacecraft 002, 009, and 011 had been 80 percent successful, Block II work had moved along, and the cost spiral had stopped. After the uncertain days of February, NASA officials began to sense that a recovery from the tragedy was under way. Drawing together, workers at all NASA centers, representing a vast amount of technical, recovered their morale through hard work more rapidly than might have been expected. Much of Apollo's chance for recovery rested on the fact that the Block II advanced version of the command module was well along in-manufacturing and that most of its features were direct improvements over-the faults of the earth-orbital Block I. Moreover, the Saturn V, after experiencing difficulties in the development of its stages, seemed on the track now. If Apollo had seemed complicated before the fire, it appeared even more so afterward. If it gave an impression of being hurried in late 1966, it gathered still more momentum in late 1967. If an extreme level of attention had been given to aspects of crew safety and mission success before the deaths of Grissom and his crew, it rose yet higher after they were gone. But among the Apollo managers there were still nagging fears that something might slip past them, something might be impossible to solve. By mid-1967, however, they were so deep in their work that they could not avoid a growing confidence. The next month, in July, Mueller and an entourage visited the North American plant at Downey* to see what the contractor had done about the Thompson Board's recommendations. As they walked around the manufacturing area, Mueller seemed generally pleased with progress. (43) Within a very few months, that progress was to be demonstrated in a very satisfactory manner. Birds, reptiles, and animals of higher and lower order that gathered at the Florida Wildlife Game Refuge (also known by the aliases of Merritt Island Launch Annex and Kennedy Space Center) at 7:00 in the morning of 9 November 1967 received a tremendous jolt. When the five engines in the first stage of the Saturn V ignited, there was a man-made earthquake and shockwave. As someone later remarked, the question was not whether the Saturn V had risen, but whether Florida had sunk. The flight went almost exactly as planned, and the huge booster rammed its payload into a parking orbit 185 kilometers above the earth. After two revolutions, the S-IVB third stage propelled the spacecraft outward to more than 17 000 kilometers, where it cut loose from the S-IVB and started falling earthward. Then the service module fired, to send the spacecraft out to 18 000 kilometers for a four-and-a-half hour soak in the supercold and hot radiation of space. Telemetry signals noted no degradation in cabin environment. with the spacecraft nose pointed toward the earth, the service module engine fired again. When the spacecraft reached the 122,000-meter atmospheric reentry zone, it was blunt-end forward and traveling at a speed of 40,000 kilometers per hour. Even before spacecraft 017 had set out on its trip, the Manned Spacecraft Center was working hard on how to get Apollo to the moon before 197O--only a little more than two years away. On 20 September, Low and others met with top manned space flight officials in Washington to present the center's plan, the key features of which were the need for additional lander and Saturn V V development flights and the incorporation of a lunar orbital flight into the schedule. Owen Maynard presented plans for scheduling seven types of missions that would lead step by step to the ultimate goal. He described these steps, "A" through "G," with G as the lunar landing mission. Phillips asked that the group consider carefully both the pros and cons of flying an additional Saturn V flight. Wernher von Braun and Low favored the flight--von Braun, because he felt the launch operations people would need the experience, and Low, because he believed that data from several flights would be needed to make certain that the big booster was indeed ready for its flight to the moon. Against these opinions, Phillips cited the tremendous workload an added flight would place on the preflight crews at Kennedy, and Mueller reminded the meeting of the already crowded launch - schedule for 1968. An additional lunar module mission would be flown only if LM-1 were unsuccessful. Most discussion centered on the insertion of a lunar orbital flight into the schedule. Houston wanted "to evaluate the deep space environment and to develop procedures for the entire lunar landing mission short of LM descent, ascent and surface operations." Mueller remarked that he regarded the lunar orbit mission as just as hazardous as the landing mission. But the Texas group argued that they had no intention of flying the vehicle closer to the moon than 15 000 meters. They pointed out that the crew would not have to train for the actual landing, but it would give them a chance to develop the procedures for getting into lunar orbit and undocking and for the rendezvous that the lunar landing crew would need. Mueller said, "Apollo should not go to the moon to develop procedures." Low reminded him that crew operations would not be the main reason for the trip; there was still a lot to be learned about communications, navigation, and thermal control in the deep space environment. (46) Although a final decision on the lunar orbital mission was not made until later, Maynard's seven-step plan was generally adopted throughout NASA. Plenty of wrinkles remained to be ironed out, but by the end of 1967 Apollo seemed to be rounding the corner toward its ultimate goal, despite the most tragic event that manned space flight had so far encountered.